Simon Turner at Northrop & Johnson Asia sends news of a further $500,000 price drop on the 36.88m catamaran power yacht Phatsara. Designed by Incat Crowther and delivered in 2012 by Silkline International in Thailand to DNV standard, she has a 8.4m beam and accommodates 13 guests. 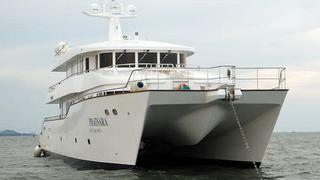 Twin 1,800hp Caterpillar engines give her a range of 1,500 nautical miles. Phatsara recently underwent a full Lloyd's survey, which is available to prospective buyers. Phatsara is now down to $6.5 million.